Nick and Johnny Red Hot Xtra Strong Portion Snus! Hold on to your taste buds! Great nicotine hit and a great snus worth trying! 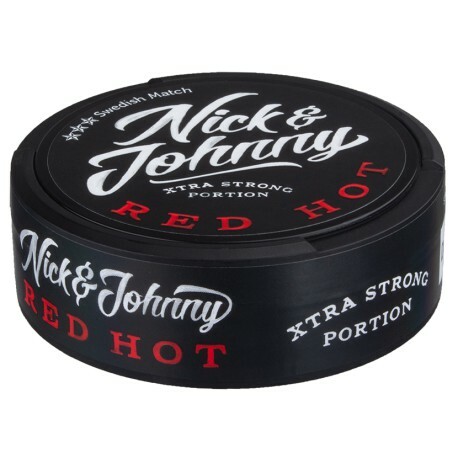 Hold on to your taste buds for Nick & Johnny Red Hot Xtra Strong Portion Snus! This member of the Nick and Johnny family is a Snus with a medium-bodied tobacco character with clear hints of chili. If you remember Red Hots candy, this describes the taste better than chili. Great nicotine hit and a great snus worth trying! The flavor is good but it doesn't taste like cinnamon or red hot chewing gum. It has a tobacco taste, mixed with a bell pepper. Really was hoping for a strong cinnamon with this one and got something that really didn't have any flavor at all (cinnamon or otherwise). It wasn't a horrible taste...just really lacked the flavor profile that I was hoping for. Experienced confusion when I first tried it. Similar to the first cup of coffee I ever had. Wasn't sure if I liked it or not. After I had acclimated to the taste I found enjoyed the flavor. I find the nicotine content is too high for me to use regularly. If it were in a regular strength I would use it more often. I bought a couple of cans of this, along with a couple of cans of Americana with my last order. I'm still figuring out what to make of the Americana, but I have no hesitation here. This is really good. I think the folks comparing it to cinnamon candies, but without the sweetness are on track. I don't get a lot of tobacco flavor with this snus, but the cinnamon is not at all cloying. This will stay in my rotation for sure. I buy 3 rolls of this at a time. My all day snus for awhile. Tastes like big red gum! Never noticed the chili hints. But maybe that's me? All around great snus. Good flavor, not really "hot"
I could taste the N&J flavor (which I love), and something else - maybe black pepper? Didn't really taste cinnamon, chili or clove, but it's a good taste to me. Nice nic hit, I'll probably get more. I really don't know what to make of this snus. My best description would be tobacco and black pepper. I'm good with a wide variety of flavors but to me this tasted bad. There were reviews indicating that it tasted like 'red hot' candies or other cinnamon candies less the sweetness... I could not disagree more. I did not get the slightest hint of cinnamon. I labored through 2 cans and threw the remaining 3 away - that's something I've never done before. I have been holding off on trying this snus because I figured it would be like sweet cinnamon candy. I was wrong. It does have a flavor sort of like the cinnamon heart candies minus the sugar. Definitely in my top 5 choices now. I was really looking forward to Nick & Johnny Red Hot Xtra Strong and the wait was worth it! I do not get a sweet Red Hot candy flavor (maybe the slightest hint) but I do get a nice, wonderful warm to hot feeling in my mouth. Swedish Match is amazing! The 1.3mg Nicotine rating seems a little underrated... The Nicotine comes on strong for sure. N&J RH is the perfect mix in my daily rotation! I can't say this enough, SnusCentral has the best customer service hands down! Great snus,just don't be fooled by the flavor descrption,I. Have yet to notice any chillli flavor.tastes. more like red hots candy.nic hit is. Great.very unique snus. I don't care for this snus much, but it's the taste that it doesn't suit my fancy. It kind of tastes like those red hot candies. I'm mostly a regular snus kind of guy, but I wanted to give these a try since I love N&J White. It is a great blend because when I first heard of mixing chili and tobacco, I thought it would make me throw up. This is an original product. I'm sure some people will like it, but just not me.